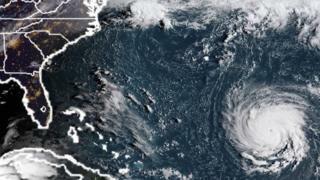 Evacuations have been ordered as the US East Coast braces for Hurricane Florence - in what may be the strongest storm to hit the region in decades. South Carolina's governor ordered the evacuation of its entire coastline while North Carolina and Virginia have declared states of emergency. Officials say Florence is now a category four storm with 130mph (195km/h) winds, and gaining strength. It is expected to strike the Carolinas by Thursday. The weather system could reach category five as its draws strength from the warm Atlantic waters, say forecasters. It would be the first category four storm to hit the region since Hugo ravaged North Carolina in 1989, wreaking $7bn (£5.3bn) in damage and claiming 49 lives. The National Hurricane Center (NHC) says Florence has the makings of an "extremely dangerous" meteorological event. It may bring catastrophic levels of rain and flooding to coastal and inland regions. The NHC said: "There is an increasing risk of life-threatening impacts from Florence: storm surge at the coast, freshwater flooding from a prolonged and exceptionally heavy rainfall event inland, and damaging hurricane-force winds." National Weather Service meteorologist Dan Miller told The State newspaper in South Carolina: "Somebody is going to suffer devastating damage if this storm continues as it is currently forecast." US President Donald Trump has cancelled plans for a rally on Friday in Mississippi because of the hurricane. Media captionWill hurricanes like those in 2017 wreak havoc yet again? South Carolina's governor has ordered the evacuation of its entire coastline starting at noon on Tuesday in a move affecting about a million residents. 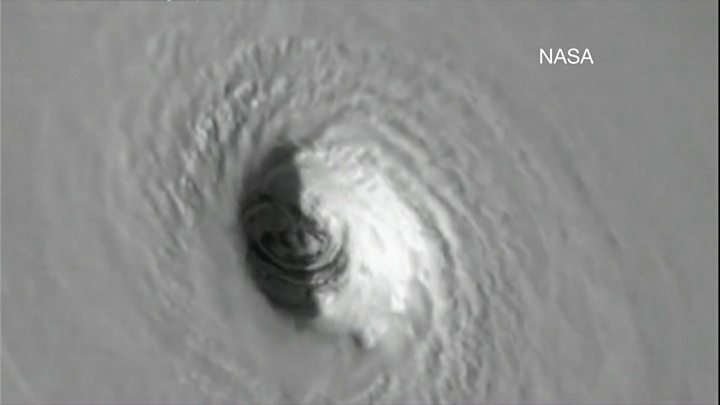 North Carolina officials on Monday ordered residents to evacuate the state's Outer Banks barrier islands while the governor described the state as "the bulls-eye" of the storm. There have been long queues in supermarkets around communities near waterways and coastlines as residents clear shelves of water, batteries and plywood. South Carolina's state emergency management agency said on Sunday that it is "preparing for the possibility of a large-scale disaster". "Pretend, assume, presume that a major hurricane is going to hit right smack dab in the middle of South Carolina and is going to go way inshore," said South Carolina Governor Henry McMaster. In North Carolina, Governor Roy Cooper waived agricultural transportation restrictions in order to allow farmers to move goods more quickly. "During harvest, time is of the essence. Action today can avoid losses due to Florence." Red flag warnings are keeping swimmers off beaches, as residents sandbag their homes in the communities of Myrtle Beach in South Carolina, and the Outer Banks in North Carolina. "Literally, they are filling buggies full of water, shopping carts full of water," Ryan Deeck, grocery department manager at a Walmart, told The Sun News in Myrtle Beach. Naval Station Norfolk, the largest naval installation in the world, is preparing to send ships away from bases to weather the storm out at sea. Holiday-makers in Boston were surprised to learn a day before their cruise departed on Friday that they would be travelling to Canada instead of Bermuda, due to hurricane conditions. Norwegian Dawn passengers arriving in Halifax on Sunday were greeted by bagpipes and quickly turned to local shops to stock up on warmer clothing. "We were hoping for really nice weather, but instead we have the same weather as at home," one passenger told the Canadian Broadcasting Corporation. Two other hurricanes are currently churning in the Atlantic Ocean. Hurricanes Isaac and Helene are expected to accelerate, but at this point, are not expected to threaten the US mainland. Are you in the area? Share your experiences by emailing haveyoursay@bbc.co.uk.